Infinite Convergence Solution’s Broadcast Message Center (BMC) is a field-proven, carrier-grade solution designed for simultaneous message delivery to multiple cellular users in a specified area. With the Infinite Convergence BMC, messages can be distributed quickly and efficiently to all active mobile devices in one or more cells or to all active devices in a cellular network. The messages can contain either emergency or commercial content and they will be distributed using proven, standards-based cell broadcast technologies. Cell broadcast technologies are ideal for use in a network during high traffic periods where the equipment would otherwise become congested and leave subscribers without important, public safety-related information. A common cause for this is in emergency situations where the cellular network traffic increases dramatically either in a geographic area or across an entire network and prevents subscribers from accessing the network. 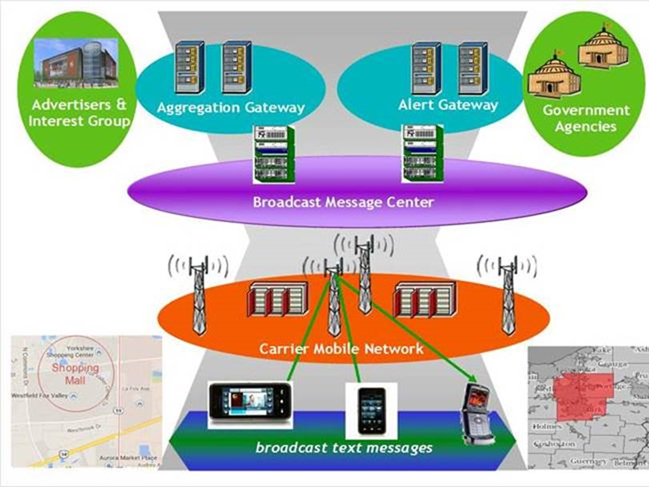 Cell broadcasting solutions avoid congestion points in the network to deliver the alerts to the affected subscribers. The BMC can additionally be used for commercial applications for targeted marketing or for features where messages to a large number of users in the same geographic area can be accomplished with minimal additional network congestion, when compared to other messaging options. The BMC has been selected for use by multiple tier-1 cellular operators in Europe, Asia, North America and South America. Use cases include earthquake and tsunami early-warnings, AMBER Alerts, and more localized warnings such as for weather alerts, fire warnings, gas leaks and campus shooting incidents. Infinite's BMC is LTE-ready and supports all of the major radio access technologies including LTE, CDMA, GSM and UMTS to maximize its reach to as many users as possible. It is WEA (Wireless Emergency Alert) compliant as well as ETSI (European Telecommunications Standards Institute) and CAP (Common Alerting Protocol) compliant. The BMC can be used in commercial applications including targeted marketing applications or for special subscriber features such as sporting event scores, special event announcements, or prayer reminders. Commercial messages can be initiated at the BMC GUI or from remotely-located Commercial Broadcast Entities. The BMC is available on Network Equipment Building System (NEBS-3) compliant ATCA hardware or on Hewlett-Packard Enterprise ProLiant DL380 rack-mounted servers. Both AC and DC electrical connectivity is supported. The BMC is available in either a standalone or a Geographically Redundant configuration to accommodate both carrier availability requirements as well as cost.